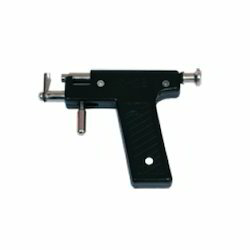 We offer our clients with a wide assortment of Ear Piercing Guns, which is best suited for quick, painless and accurate ear piercing. Our range is known for its easy usage, compact designs, skin friendliness and reliable piercing. In addition to this, our range is designed by hardened stainless steel working parts and an injection-molded handle that ensure excellent workability. In order to keep pace with never ending demands of customers, our company provides ear piece gun. Our product range is used for ear punch. 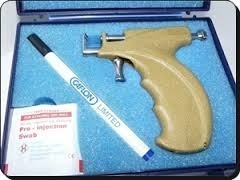 This gun peice is highly appreciated amongst clients for its easy usage and optimum performance. Clients can avail this product from us at market leading price.